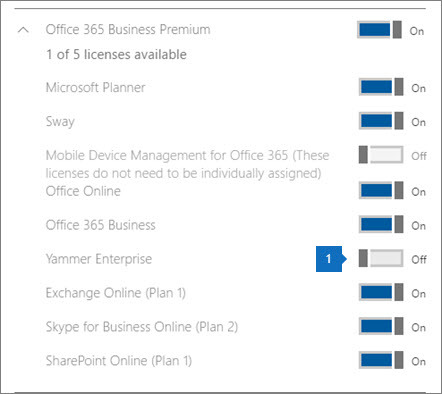 Yammer is included in most Office 365 subscriptions. You can disable Yammer for individual users, or for all users in your tenant. To keep your users from accessing Yammer, you have to first turn off their ability to sign in to Yammer with Yammer credentials, and then disable the Yammer service in their license. For detailed information about enforcing Office 365 identity in Yammer and PowerShell steps, see Start blocking users who don't have Yammer licenses. In Yammer, select Yammer settings , click Network Admin, and then click Security Settings. In the Security Settings page, go to the Enforce Office 365 Identity section, select the Enforce Office 365 identity checkbox and confirm the selection in the dialog that opens, and then choose Save. Enforcing Office 365 identity is a prerequisite step to block users without Yammer licenses. After the Enforce Office 365 identity checkbox is selected, the Block Office 365 users without Yammer licenses checkbox will be available. Select the Block Office 365 users without Yammer licenses checkbox, confirm the selection by selecting Yes, I am ready. You can also optionally log out all users to force them to sign in with Office 365 credentials, and then click Save. This step is necessary, because if Office 365 sign-in is not enforced, users can still sign in with their Yammer credentials, if they have them. Go to the Microsoft 365 admin center. On the Home page, click Active users. 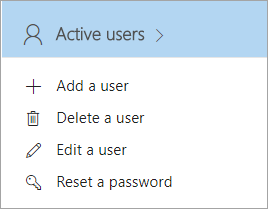 On the Active users page select a user for whom you want to disable Yammer. On the User pane choose Edit next to Product licenses. Expand the product license (Office 365 Business Premium in the following example) and turn the slider for Yammer to Off position. Repeat the steps for each user you want to disable Yammer for. You can also automate this task by using PowerShell. Before you start, follow the instructions in Enforce office 365 identity for Yammer users article to make sure your users sign in to Yammer with their Office 365 credentials. See View account license and service details with Office 365 PowerShell to list what a user's license includes, and the actual names used for each service within the license. For example, it is YAMMER_ENTERPRISE for Yammer in most Office 365 plans. The PowerShell for listing service details for all users in a tenant is also included. See Disable access to services with Office 365 PowerShell for detailed instructions for how to disable services, including Yammer, for one, or many users. Can I unsubscribe myself from Yammer?